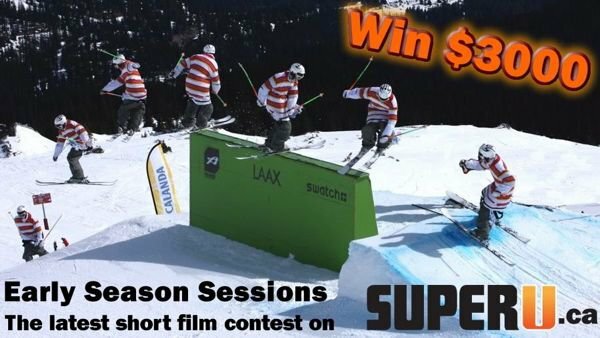 After a ton of hard work, dedication, views and votes, we are excited and proud to announce the highly anticipated finalists for the Super U 'Early Season Sessions' contest. Poorboyz' Jeff Thomas, pro skier Joe Schuster and Newschoolers.com's Jeff Schmuck will now take the next week to view and judge the top five videos and choose a winner, which will be announced on Super U.ca and right here on NS on Tuesday, January 27th. The winner will receive $3000 CDN courtesy of Super U and the possibility of being licensed to Super Channel, Canada's national pay television network. 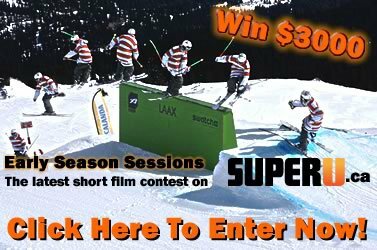 The Super U and NS staff would like to take the time to give a huge pat on the back to each and every single person who braved the lack of snow in the early season and in turn worked their asses off to put together a video for this contest, along with everyone who took the time to watch the entries and vote on them. Stay tuned to Super U.ca and NS for the announcement of the winner in under two weeks, and for details on another potential contest courtesy of Super U in the coming months.